I have a number of additional generations of this family to share. Please direct Queries to the email link above! I would like to thank Donna Collings, Fulton Underhay, Karen LeGrow Owens, Joan Wendling, and the many others who contributed to this file! Note: This file is a work in progress, as are most of the lineages on the Register. As such, it may contain omissions or errors. Always check all data, and use these files for a guide only. If you have further information on the Smallwood family, please contact me. I am particularily short on information on those Smallwoods that stayed on P.E.I. Joan Wendling reports that there is a newsletter of interest to Smallwood researchers. It is written by Joyce Cates of Ohio. Email Joyce via the link provided for more info! 1. Charles Smallwood b. CIR 1695, m. Unknown. Charles Note: Resided, Norfolk Co., Virginia. 2.	i	Charles Smallwood b. CIR 1725. 2. Charles Smallwood (1.Charles1) b. CIR 1725, m. Ann. Charles died ___ 1790, Norfolk Co., Virginia. 3.	i	Capt. Joseph Smallwood. 3. Capt. Joseph Smallwood (2.Charles2, 1.Charles1) b. Norfolk, Virginia., Occupation: Sea Captain/Farmer, m. Margaret (Magdalen) MacRobie, b. Whitehaven, Cumbria Co., England. Capt. Note: Resided, Lot 38, PEI till 1800. Owned land Lot 56.
i	John Smallwood b. Jan 23 1786, Baptised: ___ 1787, St. Peters, PEI., m. Jun 21 1813, in Five Mile House, PEI., Violet Owens. John died Sep 06 1878, St. Andrews, PEI. 4.	ii	Dorinda Smallwood b. Dec 05 1788. 5.	iii	Eleanor Smallwood b. Sep 27 1790. 6.	iv	Mary Smallwood b. Sep 07 1792. 7.	v	James Smallwood b. Mar 17 1794.
vi	William Smallwood b. Mar 12 1795, Baptised: Jun 22 1795, m. Feb 02 1832, Elizabeth Stewart. 8.	vii	Margaret Smallwood b. Dec 08 1797. 9.	viii	Catherine Smallwood b. Feb 17 1802. 4. Dorinda Smallwood (3.Capt.3, 2.Charles2, 1.Charles1) b. Dec 05 1788, Baptised: Jul 09 1789, m. Jul 17 1809, William Farquharson, b. ___ 1764, Banffshire, Scotland., (son of William Farquharson and Ann Gordon) Occupation: Farmer of Mermaid Farms, d. ___ 1839, Note: Resided, Lot 48, 6c - Clifton, PEI. Dorinda died ___ 1864, Interred: Clifton Cem., PEI., Note: Resided, Clifton, PEI. 10.	i	Elizabeth BETSY Farquharson b. ___ 1812.
ii	Harriett (Margaret) Farquharson b. ___ 1815, d. ___ 1904, Note: Unmarried. 11.	iii	Hannah Farquharson b. ___ 1817.
iv	Robert Farquharson d. ___ 1851. 12.	v	Stephen B. Farquharson b. ___ 1823. 13.	vii	William HENRY Farquharson b. ___ 1827. 5. Eleanor Smallwood (3.Capt.3, 2.Charles2, 1.Charles1) b. Sep 27 1790, Baptised: Feb 25 1791, m. Jan 14 1809, James Young, d. ___ 1851.
iii	Violet Young m. Isaiha Horne. iv	Mary Young m. Mr. Ferguson. v	Eleanor Young m. John Stewart. viii	Matilda Young m. John Gillespie. xii	Elizabeth Young m. Edmund Rodd, b. ___ 1813, d. ___ 1898. 6. Mary Smallwood (3.Capt.3, 2.Charles2, 1.Charles1) b. Sep 07 1792, Baptised: Mar 21 1793, m. James Farquharson, b. ___ 1791, (son of William Farquharson and Charlotte Helen Brown) d. Nov 10 1875, St. Andrews, PEI., Note: Resided, St. Andrews, PEI. Mary died Jan 20 1855, St. Andrews, PEI., Note: Resided, St. Andrews, PEI. 16.	i	William Farquharson b. Oct 03 1814. 17.	iii	James Farquharson b. ___ 1815. 18.	iv	John Farquharson b. ___ 1819.
v	Mary Ann Farquharson b. ___ 1820, m. (1) ___ 1843, Angus Sutherland, m. (2) ___ 1848, Alexander Miller, b. ___ 1818, d. ___ 1894. Mary died ___ 1865.
vi	Margaret Farquharson b. ___ 1821, m. William H. M'Ewen, b. ___ 1812, d. ___ 1897, Note: Resided, St. Peter's, PEI. Margaret died ___ 1901.
vii	Sampson Farquharson b. ___ 1829, Occupation: Schoolteacher/Bookkeeper., d. ___ 1898, Note: Resided, Southport, PEI. 19.	viii	Maria Farquharson b. ___ 1832. 20.	ix	Jane Farquharson b. ___ 1833. 21.	x	Benjamin Farquharson b. Apr 28 1835. 22.	xi	Robert Farquharson b. Jul 04 1838. 23.	xii	Dorenda Farquharson b. ___ 1839. 7. James Smallwood (3.Capt.3, 2.Charles2, 1.Charles1) b. Mar 17 1794, Baptised: Jun 14 1794, Church of England, Charlottetown, PEI., m. Mary Brown, b. ___ 1799, Covehead, PEI., (daughter of John Brown and Isabella Lawson) d. ___ 1890, Note: Resided, Lot 48, PEI. James died ___ 1863, Note: Resided, Lot 48, PEI. 24.	i	William Smallwood b. ___ 1829.
ii	Charles Smallwood b. ___ 1833, d. ___ 1917. 25.	iii	David Smallwood b. ___ 1839.
iv	Joseph Smallwood b. ___ 1860, m. Isabella Rattray. 8. Margaret Smallwood (3.Capt.3, 2.Charles2, 1.Charles1) b. Dec 08 1797, Baptised: Feb 01 1799, m. Norman M'Leod. 9. Catherine Smallwood (3.Capt.3, 2.Charles2, 1.Charles1) b. Feb 17 1802, Baptised: Mar 27 1802, m. James Curtis Brown, b. ___ 1796, (son of Lawrence Brown and Jean Jamieson) d. Jan 19 1876, Interred: St. James Ch. Cem, West Covehead, PEI., Note: Resided, Lot 33, PEI. Catherine died Aug 17 1882, Interred: St. James Ch. Cem, West Covehead, PEI., Note: Resided, Lot 33, PEI. i	John Brown b. Lot 33, PEI., m. Christie Campbell. 27.	ii	William Brown b. Nov 07 1840.
iii	Robert Brown b. Lot 33, PEI., m. Mary Rochester, b. Newfoundland. v	Charles Brown m. (1) Jessie Campbell, m. (2) Eliza Nicholson, b. Wiltshire, PEI., Note: Resided, PEI/ moved to US. Charles Note: Resided, PEI/ moved to US. vi	James Brown m. Mary Ashe, b. St. John. vii	Harriett Brown m. David Woolridge, b. Covehead, PEI. 29.	viii	Elizabeth ELIZA Brown. x	Margaret Brown d. Young. 10. Elizabeth BETSY Farquharson (4.Dorinda4, 3.Capt.3, 2.Charles2, 1.Charles1) b. ___ 1812, m. ___ 1838, John Bovyer II, b. Aug 26 1805, Baptised: Mar 12 1806, (son of John Bovyer and Mary (Margaret) Auld) d. Jun 05 1867, Interred: Clifton United Church Cem., PEI., Note: Resided, Fullerton's Marsh, PEI. Elizabeth died Oct 02 1891, Mount Herbert, PEI., Note: Resided, Fullerton's Marsh, PEI. 31.	i	Robert Bovyer b. ___ 1838. 32.	ii	John Bovyer III b. ___ 1841.
iii	Hannah Bovyer b. ___ 1844, d. Dec 06 1883, Interred: Clifton United Church Cem., PEI. iv	Keziah Bovyer b. ___ 1845, Lot 48, P.E.I., Occupation: Dressmaker., d. ___ 1905, Note: Unm, Resided, Lot 48, P.E.I. 33.	v	Henry Bovyer b. ___ 1847. 34.	vi	Jane Bovyer b. ___ 1848.
vii	Charles Bovyer b. ___ 1850, d. Dec 11 1860, Interred: Clifton United Church Cem., PEI. 35.	viii	Emma Bovyer b. ___ 1851.
ix	Sarah Bovyer b. ___ 1860, d. Dec 03 1865, Interred: Clifton United Church Cem., PEI. 11. Hannah Farquharson (4.Dorinda4, 3.Capt.3, 2.Charles2, 1.Charles1) b. ___ 1817, m. ___ 1848, John M'Gregore, b. ___ 1819, d. ___ 1906, Interred: Crossroads Christian Cem., PEI., Note: Resided, Crossroads, PEI. Hannah died Sep 26 1903, Interred: Crossroads Christian Cem., PEI., Note: Resided, Crossroads, PEI. 36.	i	Cyrus V. M'Gregor b. ___ 1849. 37.	ii	Henry M'Gregor b. ___ 1850. 12. Stephen B. Farquharson (4.Dorinda4, 3.Capt.3, 2.Charles2, 1.Charles1) b. ___ 1823, Lot 48, PEI., m. ___ 1850, Sarah Ferguson, b. ___ 1822, d. May 26 1907, Clifton, PEI., Note: Resided, Clifton, P.E.I. Stephen died ___ 1902, Note: Resided, Clifton, P.E.I. i	Albert Farquharson b. ___ 1854, Note: Resided, Washington State. 38.	ii	Sarah Ann Farquharson b. ___ 1856. 39.	iii	Cassie Ida Farquharson b. ___ 1859. 13. William HENRY Farquharson (4.Dorinda4, 3.Capt.3, 2.Charles2, 1.Charles1) b. ___ 1827, 1901 Census., m. ___ 1864, Keturah B. Rogers, b. Mar 02 1835, Wales., (daughter of Jonah Rogers and Hannah (Anna) Thomas) d. Jun 01 1917, Note: Resided, Clifton, PEI. William died ___ 1911, Note: Resided, Clifton, PEI. i	Rogers D. Farquharson b. ___ 1865, Lot 48, PEI., Occupation: Farmer., d. Mar 31 1916, Note: Unmarried., Lot 48.
ii	Anna Dorenda Farquharson b. ___ 1868, Lot 48, PEI., m. James D. White, b. ___ 1865, d. Feb 07 1936, Interred: Clifton United Church Cemetery, PEI., Note: Resided, Charlottetown, PEI. Anna died Oct 12 1958, Interred: Clifton United Church Cemetery, PEI., Note: Resided, Charlottetown, PEI. 14. Margaret Young (5.Eleanor4, 3.Capt.3, 2.Charles2, 1.Charles1) m. Henry Sanders. 15. George Young (5.Eleanor4, 3.Capt.3, 2.Charles2, 1.Charles1) m. Mar 07 1849, Jane Ann Weatherbie, b. Oct 10 1824, Lot 49, PEI., Baptised: Nov 16 1824, (daughter of John S. Weatherbie and Elizabeth Acorn). 41.	i	John Young b. ___ 1849. 42.	ii	James JIM Young b. ___ 1853.
iii	Timothy TIM Young m. (1) Christy M'Leod, m. (2) Kate Singleton. 43.	v	Benjamin Duncan Young b. ___ 1864.
vi	Ellen Young m. Mark Carver. vii	Ruth Matilda Young m. William Lord. 16. William Farquharson (6.Mary4, 3.Capt.3, 2.Charles2, 1.Charles1) b. Oct 03 1814, Occupation: Farmer., m. Aug 19 1851, Arabella Hood, b. ___ 1827, d. Jul 24 1890, Charlottetown, PEI., Interred: Clifton United Church Cem., PEI., Note: Resided, Bunbury, PEI. William died Oct 22 1880, Interred: Clifton United Church Cem., PEI., Note: Resided, Bunbury, PEI. 44.	i	James Samuel Farquharson b. ___ 1853.
ii	Mary Jane Dorinda Farquharson b. ___ 1854, m. ___ 1884, William R. Webster. iii	Margaret Emmaline Farquharson b. ___ 1856, m. J. Patton. iv	Willemina Farquharson b. ___ 1859, d. ___ 1880, Interred: Clifton United Church Cem., PEI. v	Olive Eliza Farquharson b. ___ 1861, d. ___ 1888, Interred: Clifton United Church Cem., PEI. vi	Ida Bethesda Farquharson b. ___ 1865, m. ___ 1886, Nathaniel Perry, Note: Resided, Bunbury, PEI. Ida died Jul 19 1919, Interred: Clifton United Church Cem., PEI. vii	Franklyn Clayton Farquharson b. ___ 1867, m. Bessie C. Douglas (or Bertha M'Ewen), b. ___ 1883, d. ___ 1954, Note: Resided, California. Franklyn Note: Resided, California. 45.	viii	Robert Ernest Farquharson b. ___ 1870. 17. James Farquharson (6.Mary4, 3.Capt.3, 2.Charles2, 1.Charles1) b. ___ 1815, Occupation: Farmer/Hotel Keeper, m. ___ 1864, Jane Smith, b. ___ 1844, d. ___ 1926, Note: Resided, Lot 37, PEI (Census 1891). James died ___ 1911, Note: Resided, Lot 37, 1891, Charlottetown, 1901, PEI. i	William Farquharson b. ___ 1868, m. Miss M'Leod, Note: Resided, Quincy, Mass. William died ___ 1913, Note: Resided, Quincy, Mass. ii	Amanda Farquharson b. ___ 1869, m. ___ 1893, Charles Farrent. iii	Almelia (Almeda) A. Farquharson b. CIR 1874, Occupation: Dry Goods Clerk., Note: Resided, Charlottetown, PEI. iv	Delia Smith Farquharson b. CIR 1876, Occupation: Dry Goods Clerk., d. ___ 1929.
v	Orella Farquharson b. Apr 21 1878, m. ___ 1896, Kenneth Ferguson, b. Apr 17 1875, d. Jun 14 1959, Interred: Charlottetown People's Cem., PEI. Orella died Jun 02 1947, Interred: Charlottetown People's Cem., PEI. vi	James A. Farquharson b. ___ 1880, Occupation: Steam Boating. 18. John Farquharson (6.Mary4, 3.Capt.3, 2.Charles2, 1.Charles1) b. ___ 1819, m. ___ 1849, Jane (Mary) M'Gregor, b. ___ 1823, d. May 10 1907, Interred: Crossroads Christian Cem., PEI., Note: Resided, Mt. Herbert, PEI. John died Feb 04 1894, Interred: Crossroads Christian Cem., PEI., Note: Resided, Mt. Herbert, PEI. 46.	i	James Sampson Farquharson b. ___ 1849. 47.	ii	Mary Susanna Farquharson b. ___ 1851.
iii	William Benjamin Farquharson b. ___ 1853, m. ___ 1874, Margaret (Maggie) Ferguson. William died Mar 29 1877, Interred: Crossroads Christian Cem., PEI. iv	George Miller Farquharson b. ___ 1856, m. Anna Diel, b. CIR 1849, d. Jul 15 1891, Interred: Crossroads Christian Ch. Cem., PEI., Note: Resided, Johnston's River, PEI. George died May 06 1893, Interred: Crossroads Christian Cem., PEI., Note: Resided, Johnston's River, PEI. 48.	v	Margaret Ellen Maria Farquharson b. ___ 1858. 49.	vi	Jane Ann Dorenda Farquharson b. ___ 1861.
vii	Annabella H. Farquharson b. ___ 1863, d. Apr 20 1879, Interred: Crossroads Christian Cem., PEI. 19. Maria Farquharson (6.Mary4, 3.Capt.3, 2.Charles2, 1.Charles1) b. ___ 1832, m. ___ 1849, James Alan Miller, b. ___ 1824, d. ___ 1894, Note: Resided, Frenchfort, PEI. Maria died ___ 1906, Note: Resided, Frenchfort, PEI. i	Mary J. Miller b. ___ 1854, m. Peter M'Fadyen. Mary died ___ 1875.
ii	Benjamin Miller b. ___ 1855, d. ___ 1944. 50.	iii	Louisa Dorenda Miller b. Dec 25 1857.
iv	William D. Miller b. ___ 1859, d. ___ 1922, Note: Resided, Revelstoke, BC. 51.	v	James Alan Miller b. ___ 1865. 52.	vi	Martha Ann Miller b. ___ 1866.
vii	Lewis Miller b. ___ 1867, d. ___ 1867.
viii	Dolly Elizabeth Miller b. ___ 1870, m. Robert Jones. Dolly died ___ 1892. 20. Jane Farquharson (6.Mary4, 3.Capt.3, 2.Charles2, 1.Charles1) b. ___ 1833, m. ___ 1850, George Miller, b. ___ 1822, d. ___ 1869, Note: Resided, Pisquid, PEI. ii	Jane Miller b. ___ 1856.
iii	Robert Miller b. ___ 1857.
iv	George Miller b. ___ 1859. 54.	v	William Henry Miller b. ___ 1862.
vi	Caroline Miller b. ___ 1863.
vii	Livinia Miller b. ___ 1866. 21. Benjamin Farquharson (6.Mary4, 3.Capt.3, 2.Charles2, 1.Charles1) b. Apr 28 1835, Occupation: Farmer., m. Aug 06 1862, in PEI., Mary Jane Coffin, b. ___ 1841, Savage Harbour, PEI., d. Apr 05 1895, Note: Resided, St. Andrews, PEI. Benjamin died Dec 02 1916, Note: Resided, St. Andrews, PEI. 55.	i	Olive Elizabeth Farquharson b. May 31 1863. 56.	ii	Mary Catherine (Cassie) Farquharson b. Jul 21 1865. 57.	iii	Francis (Frank) Charles Farquharson b. Jan 18 1868.
iv	Dorenda Ann Farquharson b. Jan 21 1872, Lot 38, PEI., d. Oct 08 1933, Note: Unmarried. 58.	v	Lottie Jane Farquharson b. Oct 02 1881. 22. Robert Farquharson (6.Mary4, 3.Capt.3, 2.Charles2, 1.Charles1) b. Jul 04 1838, St. Andrews, PEI., Occupation: Farmer/J.P, m. Nov 03 1860, in PEI., Caroline Coffin, b. Apr 14 1840, St. Andrews, PEI., (daughter of Kimball Coffin and Ann NANCY Sterns) d. ___ 1893, Note: Resided, West St. Peters, PEI. Robert died ___ 1910, St. Andrews, PEI., Note: Resided, West St. Peters, PEI. 59.	i	Bertha Jane Farquharson b. Jul 28 1861. 60.	ii	Ida May Coffin Farquharson b. Mar 15 1864.
iii	Annie Farquharson b. Feb 10 1866, d. ___ 1866, Note: Age 18 days. iv	Carrie Farquharson b. Apr 03 1867, d. ___ 1888, Note: Unmarried. 61.	v	Alfred Percy Farquharson b. Jun 23 1869. 62.	vi	Edith Dorenda Farquharson b. Apr 17 1871. 63.	vii	Mary Leila Farquharson b. Jan 27 1874. 64.	viii	Margaret MAGGIE Elizabeth Farquharson b. Jul 06 1875. 65.	ix	Ernest William Farquharson b. Mar 01 1880. 23. Dorenda Farquharson (6.Mary4, 3.Capt.3, 2.Charles2, 1.Charles1) b. ___ 1839, m. Aug 01 1861, in PEI, Duncan Coffin, b. Apr 05 1838, Mt. Stewart, PEI., (son of Kimball Coffin and Ann NANCY Sterns) d. Sep 25 1893, Winthrop, Sussex, Mass. Dorenda died ___ 1867.
i	Annie Dorenda Coffin Occupation: Homemaker, m. Henry Jardine, Note: Resided, Trenton, NS. Annie Note: Resided, Trenton, NS. ii	Kimble Edwin Coffin b. ___ 1862, d. Sep 24 1864.
iii	Laura Coffin b. ___ 1864, m. Allan (Coffin). iv	Mary JANE Coffin b. CIR 1865, Mt. Stewart, PEI., d. CIR 1898, Note: Unmarried. 24. William Smallwood (7.James4, 3.Capt.3, 2.Charles2, 1.Charles1) b. ___ 1829, Lot 48, PEI., m. Feb 28 1853, Charlotte Rattray, b. ___ 1833, PEI., d. ___ 1917. William died ___ 1911, Note: Resided, Clifton, PEI. i	James Thomas Smallwood b. ___ 1854, d. Feb 21 1882. 66.	ii	Albert HAVILAND Smallwood b. ___ 1862.
iii	Henry Chapman Smallwood b. ___ 1863, Lot 48, PEI., m. ABT 1890, Emma C. Jenkins, b. ___ 1868, PEI., d. ___ 1940. Henry died ___ 1945.
iv	Frances Smallwood b. ___ 1869, Lot 48, PEI., Occupation: Farmer., d. Nov 08 1943.
v	William Herbert Smallwood b. ___ 1871, Lot 48, PEI., Occupation: Farmer. 25. David Smallwood (7.James4, 3.Capt.3, 2.Charles2, 1.Charles1) b. ___ 1839, Prince Edward Island., Occupation: Sawmill Op./Bootmaker., m. ___ 1861, in St. Johns, Nfld., Julia Cooper. David died Aug 12 1928, St. John's, Newfoundland., Note: Resided, Gambo/St. John's, Newfoundland. 67.	i	Charles William Smallwood b. Jan 23 1873. 68.	ii	Frederick (Fred) Smallwood. iii	David Smallwood Occupation: Lawyer. iv	Jack Smallwood Note: Resided, Australia. v	Duncan Smallwood Occupation: Inventor of Adding Mach., Note: Resided, California. vi	Fannie (Aunt Fan) Smallwood Occupation: BA./ Nurse. vii	Alexander (Sandy) Smallwood Occupation: Wheat Farmer. viii	Joe Smallwood d. Quidi Vidi Lake, Nfld., Note: Drowned. 26. James M'Leod (8.Margaret4, 3.Capt.3, 2.Charles2, 1.Charles1) m. Catherine Sanders, (daughter of Henry Sanders and Margaret Young). 69.	i	Damaris Watts WATSIE M'Leod. 27. William Brown (9.Catherine4, 3.Capt.3, 2.Charles2, 1.Charles1) b. Nov 07 1840, m. (1) Mary Anne Campbell, m. (2) Mary Lucretia Kielly, b. Feb 22 1854, (daughter of Robert Kielly Jr. and Mary Murphy) d. Apr 02 1939, Interred: St. James Ch. Cem, West Covehead, PEI. William died Aug 10 1902, Interred: St. James Ch. Cem, West Covehead, PEI. 70.	i	Joseph Smallwood Brown b. ___ 1870. 71.	ii	Norman Campbell Brown b. ___ 1875. 72.	iii	Mary Ann Brown b. ___ 1879.
iv	Angus Campbell Brown b. Jan 29 1881, d. Jan 01 1902, Interred: St. James Ch. Cem, West Covehead, PEI., Note: Unmarried. 73.	v	George H. Brown b. Jun 08 1884. 74.	vi	Clara Brown b. ___ 1888.
vii	Ethel Brown b. ___ 1890, m. Stanley Glotch, Note: Resided, Lawrence, Mass. Ethel Note: Resided, Lawrence, Mass. viii	Victor Campbell Brown b. Jun 25 1895, d. Jan 02 1981, Interred: St. James Ch. Cem, West Covehead, PEI., Note: Resided, Charlottetown, PEI. 28. Jane Brown (9.Catherine4, 3.Capt.3, 2.Charles2, 1.Charles1) m. Neil Darrach, (son of Malcolm Darrach and Janet Shaw) d. Jan 26 1884, Rollo Bay, PEI. i	John B. Darrach b. ___ 1866.
ii	Angus Alexander Darrach b. ___ 1868.
iii	James A. Darrach b. ___ 1869.
iv	Fred Darrach b. ___ 1871.
v	Sarah Darrach b. ___ 1873. 29. Elizabeth ELIZA Brown (9.Catherine4, 3.Capt.3, 2.Charles2, 1.Charles1) m. ___ 1856, John M'Gregor Jr., b. ___ 1802, Covehead, PEI., (son of Pvt. John M'Gregor and Margaret Gregor) Occupation: Constable, Shipbuilder., d. Nov 19 1879, Interred: Brackley Point Cem., PEI., Note: Resided, Harrington, PEI till 1872. Elizabeth Note: Resided, Harrington, PEI till 1872.
i	Margaret Evie AMANDA M'Gregor b. ___ 1857, Harrington, PEI., m. Dec 25 1876, David Foster, b. ___ 1836, d. ___ 1902, Note: Resided, Dunstaffnage, PEI. Margaret died Jul 24 1954, Note: Resided, Dunstaffnage, PEI. ii	Daughter M'Gregor b. ___ 1860, Covehead, PEI. 30. Mary Brown (9.Catherine4, 3.Capt.3, 2.Charles2, 1.Charles1) b. Covehead, PEI., m. Jan 19 1864, Joseph Henry Coffin, b. Jun 25 1834, Bay Fortune, PEI., (son of James Coffin and Jane Marshall) d. Fortune Bridge, PEI. i	James Lawrence Coffin b. CIR 1866, Bay Fortune, PEI. 75.	ii	David Joseph Coffin b. CIR 1866. 76.	iii	Phebe Jane Coffin b. CIR 1868. 77.	iv	John Haviland Coffin b. ___ 1870.
v	Benjamina H Coffin b. CIR 1871, Bay Fortune, PEI., m. Aug 14 1903, Joseph William White. 78.	vi	Mary Malinda Coffin b. Jun 06 1875.
vii	George Bapson Coffin b. Jan 18 1877, Forthune Bridge, PEI., Occupation: Farm Labourer. 31. Robert Bovyer (10.Elizabeth5, 4.Dorinda4, 3.Capt.3, 2.Charles2, 1.Charles1) b. ___ 1838, Lot 48, PEI., m. Eliza Ann Turner, b. ___ 1842, PEI., (daughter of Charles Turner and Eleanor Farquharson) d. ___ 1909, Interred: Clifton United Church Cem., PEI., Note: Resided, Bunbury, PEI. Robert died ___ 1912, Interred: Clifton United Church Cem., PEI., Note: Resided, Bunbury, PEI. i	Charles H. Bovyer b. ___ 1867, Lot 48, PEI., m. ___ 1908, Alice Bigerton Poole, b. ___ 1879, d. Dec 10 1954, Vancouver, BC., Note: Resided, Vancouver, BC. Charles Note: Resided, Vancouver, BC. ii	Minnie Bovyer b. ___ 1868, d. ___ 1885, Interred: Clifton United Church Cem., PEI., Note: Unmarried. iii	John M. Bovyer b. ___ 1870, Lot 48, PEI., Occupation: Op. Dairy, m. ___ 1901, Roberta Jane Jones, b. ___ 1877, (daughter of Robert Jones III and Elizabeth Mutch) d. Jan 08 1952, Vancouver, BC., Note: Resided, Vancouver, BC. John died ___ 1957, Note: Resided, Vancouver, BC. iv	Ella Bovyer b. ___ 1871, m. Stephen Haslam, b. ___ 1861, d. ___ 1940. Ella died ___ 1965.
v	Everett N. Bovyer b. ___ 1875, Lot 48, PEI., m. ___ 1903, Emma Deacon, Note: Resided, Bunbury, PEI. Everett died ___ 1946, Note: Resided, Bunbury, PEI. vi	Emma J. Bovyer b. ___ 1876, Lot 48, PEI., m. ___ 1902, Bright Balderson, b. ___ 1877, d. ___ 1941, Note: Resided, Vancouver, BC. Emma died ___ 1929, Note: Resided, Vancouver, BC. vii	Wilfred ROBERT Bovyer b. ___ 1879, Lot 48, PEI., m. Helen Margaret Gates, b. 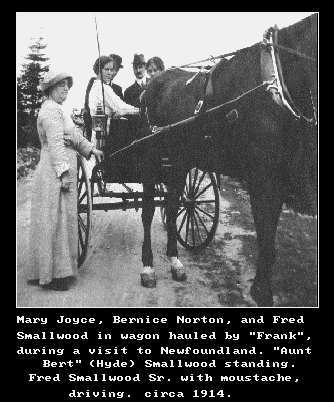 ___ 1894, (daughter of Benjamin Franklyn FRANK Gates and Clarenda Mary Hyde) d. ___ 1975, Note: Resided, Bunbury, PEI. Wilfred died ___ 1960, Interred: Clifton United Church Cem., PEI., Note: Resided, Bunbury, PEI. viii	Beatrice Bovyer b. ___ 1881, Lot 48, PEI., Note: Unm., Resided, Vancouver, BC. 32. John Bovyer III (10.Elizabeth5, 4.Dorinda4, 3.Capt.3, 2.Charles2, 1.Charles1) b. ___ 1841, Lot 48, PEI., Occupation: Farmer and milkman., m. ___ 1873, Mary Jane Mason, b. ___ 1851, PEI., (daughter of George Mason and Sophia Mutch) d. ___ 1918, Note: Resided, Vancouver, BC. John died ___ 1927, Note: Resided, Vancouver, BC. i	George Mason Bovyer b. ___ 1874, Lot 48, P.E.I., m. Isabel Leask, d. ___ 1964, Note: Resided, Duncan, BC. George died ___ 1944, Note: Resided, Duncan, BC. ii	John Wesley Bovyer b. ___ 1878, Lot 48, P.E.I., Occupation: Missionary, m. ___ 1912, Anna Ellmere, Note: Resided, Shanghai, China. John died ___ 1944, Note: Resided, Shanghai, China. iii	Mark Oswald Bovyer b. ___ 1881, Lot 48, P.E.I., d. ___ 1898, Note: See Note:. iv	Mary Jemima Bovyer b. ___ 1882, Lot 48, P.E.I., d. ___ 1882, Note: Died Young. v	Henry Hamilton Bovyer b. ___ 1889, Lot 48, P.E.I., m. (1) ___ 1909, Cora Gilbert, Note: Resided, Vancouver, BC., m. (2) ___ 1948, Minnie Balderson, b. ___ 1907, (daughter of Bright Balderson and Emma J. Bovyer). Henry died ___ 1962, Note: Resided, Vancouver, BC. 33. Henry Bovyer (10.Elizabeth5, 4.Dorinda4, 3.Capt.3, 2.Charles2, 1.Charles1) b. ___ 1847, m. ___ 1870, Selina Mutch, b. ___ 1845, (daughter of William "Brick House" Mutch and Ellen Farquharson) d. Sep 08 1915, Vancouver, BC., Note: Resided, Colorado. Henry died ___ 1911, Note: Resided, Colorado. i	William Bovyer b. ___ 1872.
ii	Ernest Bovyer b. ___ 1878, d. ___ 1897, Note: Resided, Dennison, Texas. 34. Jane Bovyer (10.Elizabeth5, 4.Dorinda4, 3.Capt.3, 2.Charles2, 1.Charles1) b. ___ 1848, m. ___ 1871, James A. Mutch, b. Dec 13 1840, (son of Robert Mutch and Maria Farquharson) d. Feb 17 1912, Interred: Mt. Herbert Mem. Cem., PEI., Note: Resided, New Glascow, NS. Jane died Feb 17 1905, Interred: Mt. Herbert Mem. Cem., PEI., Note: Resided, New Glascow, NS. i	John A. Mutch b. ___ 1874, m. Lulu Gay, Note: Resided, New Glascow, NS. John died ___ 1946, Note: Resided, New Glascow, NS. ii	Cyrus Robert Mutch b. ___ 1875, P.E.I., Occupation: Store Manager, m. Jun 12 1912, in New Glascow, NS., Jennie Cameron Muir, b. ___ 1879, Stellarton, NS., Note: Resided, New Glascow/Stellarton, NS. Cyrus died ___ 1943, Note: Resided, New Glascow/Stellarton, NS. iii	William W. Mutch b. ___ 1877, m. Elvera Anderson, Note: Resided, Salt Lake City, Utah. William died ___ 1943, Note: Resided, Salt Lake City, Utah. 35. Emma Bovyer (10.Elizabeth5, 4.Dorinda4, 3.Capt.3, 2.Charles2, 1.Charles1) b. ___ 1851, m. Daniel M'Lean, b. ___ 1854, Occupation: MacDonaldite Minister., d. ___ 1912, Note: Resided, Charlottetown, PEI. Emma died ___ 1895, Note: Resided, Charlottetown, PEI. i	Lester M'Lean b. ___ 1879, d. ___ 1905, Note: Unmarried. ii	Archibald M'Lean b. ___ 1882, m. (1) Laura Miller, m. (2) Nettie Robinson. Archibald died ___ 1970.
iii	Henry B. M'Lean b. ___ 1884, m. May M'Kenzie. Henry died ___ 1976.
iv	Minnie M'Lean m. James M'Fadyen. Minnie died ___ 1968. 36. Cyrus V. M'Gregor (11.Hannah5, 4.Dorinda4, 3.Capt.3, 2.Charles2, 1.Charles1) b. ___ 1849, m. Sophia Hirtle, Note: Resided, BC. Cyrus died Sep 03 1889, Interred: Charlottetown People's Cem., PEI., Note: Resided, BC. i	Winnifred M'Gregor b. ___ 1874, m. ___ 1894, L. H. Bear, Note: Resided, Kensington, PEI. Winnifred Note: Resided, Kensington, PEI. ii	Hirtle Cyrus M'Gregor b. ___ 1876, m. ___ 1896, Unknown, Note: Resided, Rossland, BC. Hirtle Note: Marr., Resided, Rossland, BC. iii	Lillian M'Gregor b. ___ 1878, m. ___ 1894, W. W. Moore, Note: Resided, Ottawa, Ont. Lillian Note: Resided, Ottawa, Ont. 37. Henry M'Gregor (11.Hannah5, 4.Dorinda4, 3.Capt.3, 2.Charles2, 1.Charles1) b. ___ 1850, m. ___ 1875, Eva Bovyer, Note: Resided, Vancouver, BC. Henry died ___ 1909, Interred: Crossroads Christian Cem., PEI., Note: Resided, Vancouver, BC. i	Irene M'Gregor b. ___ 1875, m. ___ 1898, Charles M'Kendrick, Note: Resided, Shag Harbour, NS. Irene Note: Resided, Shag Harbour, NS. ii	Beatrice H. M'Gregor b. ___ 1877, d. ___ 1877, Interred: Crossroads Christian Cem., PEI., Note: ae 5 Months. iii	John R. M'Gregor b. ___ 1878, m. ___ 1906, Hazel Jones, b. ___ 1884, (daughter of Robert Jones III and Elizabeth Mutch) d. ___ 1959, Note: Resided, Sea Island, BC. John died ___ 1959, Note: Resided, Sea Island, BC. iv	Tuplin M'Gregor b. ___ 1880, m. Helena Ollis, Note: Resided, Western Canada. Tuplin died ___ 1959, Note: Resided, Western Canada. v	Mary H. M'Gregor b. ___ 1883, d. ___ 1911, Interred: Crossroads Christian Cem., PEI. vi	Eva M'Gregor b. May 10 1885, P.E.I., Occupation: Housewife., m. ___ 1915, Henry Bertram Mutch, b. Mar 25 1880, PEI., (son of Henry Mutch and Margaret Moore) Occupation: Vancouver Engineering., d. Apr 24 1950, 2505 Scott St., Vancouver, BC., Interred: Apr 26 1950, Ocean View Burial Park, Burnaby, BC., Note: Resided, Vancouver, BC. Eva died Sep 25 1921, 109 Broadway E., Vancouver, BC., Interred: Sep 28 1921, Ocean View Burial Park, Vancouver, BC., Note: Resided, Vancouver, BC. vii	Roy M'Gregor b. ___ 1887, d. Young, Note: Unmarried. viii	Louisa M'Gregor m. Oliver Greatheart, Note: Resided, Vancouver, BC. Louisa Note: Resided, Vancouver, BC. ix	Emily M'Gregor b. ___ 1889, m. ___ 1913, Hugh Ollis, Occupation: Minister. x	Cyrus H. M'Gregor b. ___ 1893, Note: Resided, Alberta. xi	Harry M'Gregor b. ___ 1911, Note: Unmarried. 38. Sarah Ann Farquharson (12.Stephen5, 4.Dorinda4, 3.Capt.3, 2.Charles2, 1.Charles1) b. ___ 1856, m. Walter Noble Tanton, b. ___ 1863, d. ___ 1940, Interred: Charlottetown People's Cem., PEI., Note: Resided, Charlottetown, PEI. Sarah died ___ 1926, Interred: Charlottetown People's Cem., PEI., Note: Resided, Charlottetown, PEI. i	Lawrence Tanton b. ___ 1885, m. Ethel Fraser, b. ___ 1894, Note: Resided, Halifax, NS. Lawrence died ___ 1974, Note: Resided, Halifax, NS. ii	Elizabeth (Bessie) Tanton b. ___ 1891, m. George HOPE Mutch, b. ___ 1887, (son of George W. Mutch and Maude Parker Ings) Occupation: Farmer, d. ___ 1959, Southport, PEI., Interred: Clifton United Church Cem., PEI., Note: Resided, Southport, PEI. Elizabeth died ___ 1967, Southport, PEI., Interred: Clifton United Church Cem., PEI., Note: Resided, Southport, PEI. iii	Clara Tanton b. ___ 1897, m. James A. Miller, b. ___ 1896, d. ___ 1979, Note: Resided, Mass. Clara Note: Resided, Mass. 39. Cassie Ida Farquharson (12.Stephen5, 4.Dorinda4, 3.Capt.3, 2.Charles2, 1.Charles1) b. ___ 1859, Lot 48, PEI., m. Arthur Tanton, Note: Resided, Charlottetown, PEI. Cassie died ___ 1918, Note: Resided, Charlottetown, PEI. 41. John Young (15.George5, 5.Eleanor4, 3.Capt.3, 2.Charles2, 1.Charles1) b. ___ 1849, m. Kate Gay, b. ___ 1854, d. ___ 1941. John died ___ 1928.
i	Timothy Cephas Young b. ___ 1880, m. Christina Mary Blue, b. ___ 1881, d. ___ 1957. Timothy died ___ 1934. 42. James JIM Young (15.George5, 5.Eleanor4, 3.Capt.3, 2.Charles2, 1.Charles1) b. ___ 1853, m. Elizabeth Taylor, b. ___ 1854, d. ___ 1938. James died ___ 1937.
iii	William WILL Young m. Jennie Marrow. iv	Alexander Young b. ___ 1887, d. ___ 1967.
v	Georgia Young m. Mr. Hunter. vi	Millie Jane Young m. Walter Ings. 43. Benjamin Duncan Young (15.George5, 5.Eleanor4, 3.Capt.3, 2.Charles2, 1.Charles1) b. ___ 1864, m. Katie Sarah M'Donald, b. ___ 1888, d. ___ 1976. Benjamin died ___ 1950.
i	George Ewan Young b. ___ 1904, m. (1) Etta Murley, m. (2) Bertha Ansem. ii	Nathan Acorn Young b. ___ 1906, m. Lil Dalziel. iii	Jessie Jane Annie Young b. ___ 1908, m. Chester Whiteaway. iv	James Benjamin Young b. ___ 1910, m. Vesta Henderson. v	Lester William Young b. ___ 1912, m. Vesta M'Rae, d. ___ 1979.
vi	Frank Murdock Young b. ___ 1915, m. Doris M'Eachern. vii	Mark Lornan Young b. ___ 1917, m. Anita M'Dougall. viii	Donald Roy Young b. ___ 1919, m. Loretta M'Donald. ix	Charles Rodd Young b. ___ 1921, m. Adell Lappin. 44. James Samuel Farquharson (16.William5, 6.Mary4, 3.Capt.3, 2.Charles2, 1.Charles1) b. ___ 1853, Lot 48, PEI., m. (1) Bessie Jones, b. ___ 1869, PEI., d. ___ 1907, Interred: Clifton United Church Cem., PEI., m. (2) ___ 1909, Martha Anne Smith. James died ___ 1924.
i	Myrtle Farquharson b. ___ 1883, d. ___ 1884.
ii	Viola Gladys Farquharson b. ___ 1887, Lot 48, PEI., m. ___ 1915, George Albert Callbeck, b. Mar 26 1894, (son of Joseph Wood Callbeck and Minnie Ellen Hood) d. ___ 1971, Interred: Summerside People's Cem., PEI., Note: Resided, Summerside, PEI. Viola died ___ 1959, Note: Resided, Summerside, PEI. iii	Winnifred WINNIE Bertha Farquharson b. Mar 07 1890, Lot 48, PEI., m. ___ 1909, James Cleveland Wood, b. Apr 25 1885, d. Sep 17 1968, Interred: Crossroads Christian Ch. Cem., PEI., Note: Resided, Hazelbrook, PEI. Winnifred died Jul 02 1977, Interred: Crossroads Christian Ch. Cem., PEI., Note: Resided, Hazelbrook, PEI. iv	James Russell Farquharson b. Feb 12 1898, m. ___ 1920, Janet Adele M'Donald, b. Sep 23 1899, d. Jan 19 1980, Interred: Clifton Cemetery, PEI., Note: Resided, Bunbury, PEI. James died Feb 03 1978, Interred: Clifton Cemetery, PEI., Note: Resided, Bunbury, PEI. 45. Robert Ernest Farquharson (16.William5, 6.Mary4, 3.Capt.3, 2.Charles2, 1.Charles1) b. ___ 1870, Lot 48, PEI., m. ___ 1911, Edith Webster, b. ___ 1876, d. ___ 1960, Interred: Charlottetown People's Cem., PEI. Robert died ___ 1938, Interred: Charlottetown People's Cem., PEI. i	Cecil Farquharson b. ___ 1911, d. Young. ii	George Eric Farquharson b. ___ 1916, m. Dorothy E. Higgins, b. ___ 1914, d. ___ 1994, Interred: Charlottetown People's Cem., PEI., Note: Resided, Charlottetown, PEI. George died ___ 1971, Interred: Charlottetown People's Cem., PEI., Note: Resided, Charlottetown, PEI. 46. James Sampson Farquharson (18.John5, 6.Mary4, 3.Capt.3, 2.Charles2, 1.Charles1) b. ___ 1849, m. ___ 1879, Margaret Ferguson, b. ___ 1847, d. Jul 01 1913, Interred: United Baptist Ch. Cem., Hazelbrook, PEI. James died Dec 13 1930, Interred: United Baptist Ch. Cem., Hazelbrook, PEI. i	George Howard Farquharson b. ___ 1880, Occupation: Doctor, m. ___ 1912, Maude M'Millan. George died ___ 1954.
ii	John Benjamin Farquharson b. ___ 1882, m. ___ 1914, Lillis Pearl Jenkins, b. ___ 1884, d. ___ 1950, Interred: United Baptist Ch. Cem., Hazelbrook, PEI. John died ___ 1946, Interred: United Baptist Ch. Cem., Hazelbrook, PEI. iii	Margaret Ella Farquharson b. ___ 1885, m. ___ 1912, Verne Higgs. Margaret died +. 47. Mary Susanna Farquharson (18.John5, 6.Mary4, 3.Capt.3, 2.Charles2, 1.Charles1) b. ___ 1851, m. ___ 1879, Peter Scott, Note: Resided, North River, PEI. Mary died ___ 1919, Note: Resided, North River, PEI. i	David Scott m. Emma M'Millan, b. ___ 1886, (daughter of Hugh M'Millan and Phebe Ross) d. ___ 1920.
ii	Russell Scott m. Miss Howard, Note: Resided, Western Canada. Russell Note: Resided, Western Canada. iii	Purdy Scott m. Hattie Drake, Note: Resided, Oregon. Purdy Note: Resided, Oregon. v	Ella Scott b. ___ 1884, d. ___ 1901, Note: Unm., Resided, Cornwall, PEI. 48. Margaret Ellen Maria Farquharson (18.John5, 6.Mary4, 3.Capt.3, 2.Charles2, 1.Charles1) b. ___ 1858, m. ___ 1884, William Boyle, b. ___ 1853, d. ___ 1928, Interred: Cornwall United Church Cem., PEI., Note: Resided, Cornwall, PEI. Margaret died ___ 1888, Interred: Cornwall United Church Cem., PEI., Note: Resided, Cornwall, PEI. i	Helen Myrtle Boyle b. ___ 1886, m. Mr. Sodben, Occupation: Minister. 49. Jane Ann Dorenda Farquharson (18.John5, 6.Mary4, 3.Capt.3, 2.Charles2, 1.Charles1) b. ___ 1861, m. ___ 1893, Stewart M'Laren. Jane died ___ 1901.
i	Carrie May M'Laren b. Nov 15 1895, m. Lemuel Drake, b. Mar 03 1890, d. Sep 06 1957, Interred: Cornwall United Church Cem., PEI., Note: Resided, Meadowbank, PEI. Carrie died Sep 09 1984, Interred: Cornwall United Church Cem., PEI., Note: Resided, Meadowbank, PEI. ii	James M'Laren Note: Unmarried. 50. Louisa Dorenda Miller (19.Maria5, 6.Mary4, 3.Capt.3, 2.Charles2, 1.Charles1) b. Dec 25 1857, Frenchfort, PEI., m. Edward Lane Jr., b. Mar 16 1841, Dunstaffanage, PEI., Note: Resided, Dunstaffanage, PEI. Louisa died ___ 1933, Dunstaffanage, PEI., Note: Resided, Dunstaffanage, PEI. i	Mary Ann "Minnie" Lane b. ___ 1870, Dunstaffanage, PEI., m. May 15 1893, in Charlottetown, PEI., James Alan Miller, b. ___ 1865, Frenchfort, PEI., (son of James Alan Miller and Maria Farquharson) d. Oct 12 1953, Frenchfort, PEI, Note: Resided, Frenchfort, PEI. Mary Note: Resided, Frenchfort, PEI. ii	Harry L. Lane b. ___ 1887, m. Eleanor Nelson, Note: Resided, Anchorage, Alaska. Harry died ___ 1956, Note: Resided, Anchorage, Alaska. iii	Otto Miller Lane b. ___ 1889, m. Susan Ogilvie, Note: Resided, Armstrong, BC. Otto died ___ 1977, Note: Resided, Armstrong, BC. iv	Winnie Lane b. ___ 1896, m. Harold Hall, Note: Resided, Plymouth, Mass. Winnie Note: Resided, Plymouth , Mass. 51. James Alan Miller (19.Maria5, 6.Mary4, 3.Capt.3, 2.Charles2, 1.Charles1) b. ___ 1865, Frenchfort, PEI., m. May 15 1893, in Charlottetown, PEI., Mary Ann "Minnie" Lane, b. ___ 1870, Dunstaffanage, PEI., (daughter of Edward Lane Jr. and Louisa Dorenda Miller) Note: Resided, Frenchfort, PEI. James died Oct 12 1953, Frenchfort, PEI, Note: Resided, Frenchfort, PEI. i	Ruth Miller b. ___ 1894, m. Daniel M'Dougall, Note: Resided, Taunton, Mass. Ruth Note: Resided, Taunton, Mass. ii	Cecil Miller b. ___ 1896, m. ___ 1922, Revola Stewart. iii	Irwin Lester Miller b. ___ 1898, m. ___ 1918, Maude Isabel Shaw, b. Jun 11 1897, (daughter of Alfred Edmund Shaw and Isabelle M'Callum) d. Mar 08 1982, Note: Resided, Frenchfort, PEI. Irwin Note: Resided, Frenchfort, PEI. iv	Mary Ann Miller b. ___ 1901, m. Norman Warburton, Note: Resided, Southeastern Mass. Mary Note: Resided, Southeastern Mass. 52. Martha Ann Miller (19.Maria5, 6.Mary4, 3.Capt.3, 2.Charles2, 1.Charles1) b. ___ 1866, m. Edmund Stewart. i	May Stewart m. Stanley Scott, Note: Resided, Marshfield, PEI. May Note: Resided, Marshfield, PEI. ii	James Stewart b. ___ 1894. 53. Annie Miller (20.Jane5, 6.Mary4, 3.Capt.3, 2.Charles2, 1.Charles1) m. James Allan M'Ewen, Note: Resided, St. Peter's, PEI. Annie died ___ 1978, Note: Resided, St. Peters, PEI. i	Jane Douglas M'Ewen b. ___ 1872, m. Charles F. Anderson. ii	Lottie May M'Ewen b. ___ 1875, m. Ernest M'Ewen. Lottie died ___ 1961. 54. William Henry Miller (20.Jane5, 6.Mary4, 3.Capt.3, 2.Charles2, 1.Charles1) b. ___ 1862, m. ___ 1887, Elizabeth Roper, Note: Resided, Head of Hillsborough, PEI. William Note: Resided, Head of Hillsborough, PEI. iii	Annie Louise Miller b. ___ 1893. 55. Olive Elizabeth Farquharson (21.Benjamin5, 6.Mary4, 3.Capt.3, 2.Charles2, 1.Charles1) b. May 31 1863, Lot 38, PEI., m. ___ 1892, Albert T. Jardine, b. ___ 1864, d. ___ 1959. Olive died ___ 1938.
i	Alice Jardine b. ___ 1895, d. ___ 1971, Note: Unmarried. ii	Merton Jardine m. Mary Douglas. iii	Bessie Jardine m. Earl Warren. 56. Mary Catherine (Cassie) Farquharson (21.Benjamin5, 6.Mary4, 3.Capt.3, 2.Charles2, 1.Charles1) b. Jul 21 1865, Lot 38, PEI., m. Mar 1888, Charles Bovyer, b. ___ 1850, (son of Albert DesBrisay Bovyer and Eliza Shaw) d. Sep 1919. Mary died Feb 1928.
i	Olive Bovyer b. ___ 1889, m. (1) Victor M'Ewen, Note: Resided, Bristol, PEI., m. (2) Thomas Allan, Note: Resided, Charlottetown, PEI. Olive died ___ 1973, Note: Resided, Bristol/Charlottetown, PEI. ii	Frank Bovyer b. ___ 1891, Note: Marr. Resided, Milford, Mass. iii	Leigh Bovyer b. ___ 1892, d. ___ 1915, Note: Unmarried. iv	Earl Bovyer b. ___ 1895.
v	Harold Bovyer b. ___ 1900, Note: Resided, Australia. vi	Vernon Bovyer b. ___ 1903, Note: Resided, Milford, Mass. 57. Francis (Frank) Charles Farquharson (21.Benjamin5, 6.Mary4, 3.Capt.3, 2.Charles2, 1.Charles1) b. Jan 18 1868, Lot 38, PEI., Occupation: Farmer., m. Nov 22 1905, in Manse, Mt. Stewart, PEI., Bessie Cynthia Douglas, b. ___ 1883, d. ___ 1954, Note: Resided, West St. Peters, PEI. Francis died ___ 1956, Note: Resided, West St. Peters, PEI. i	Sadie Irene Farquharson b. Jun 30 1907, Canavoy, PEI., m. ___ 1936, Donald Alexander Acorn, b. ___ 1907, d. ___ 1976, Note: Resided, Cardigan, PEI. Sadie Note: Resided, Cardigan, PEI. ii	Roy Benjamin Farquharson b. ___ 1910, m. ___ 1944, Eleanor Douglas, Note: Resided, Mt. Stewart, PEI. Roy died ___ 1992, Note: Resided, Mt. Stewart, PEI. iii	Ernest Francis Farquharson b. ___ 1915, Note: Unmarried. iv	Viola Louise Farquharson b. Nov 04 1917, m. ___ 1937, Howard Woodrow Douglas, b. Jul 26 1912, Charlottetown, PEI., d. ___ 1995, Note: Resided, Charlottetown, PEI. Viola Note: Resided, Charlottetown, PEI. 58. Lottie Jane Farquharson (21.Benjamin5, 6.Mary4, 3.Capt.3, 2.Charles2, 1.Charles1) b. Oct 02 1881, Lot 38, PEI., m. Nathan M'Ewen. Lottie died ___ 1948.
i	Ivan M'Ewen b. ___ 1909, d. ___ 1929.
ii	Edith M'Ewen m. ___ 1943, Sterling M'Ewen, b. ___ 1918, (son of Walter M'Ewen and Annie Coffin) Occupation: Merchant, Note: Resided, Bristol, PEI. Edith Note: Resided, Bristol, PEI. iii	Gladys M'Ewen m. ___ 1945, Eldon Drake, Note: Resided, NS. Gladys Note: Resided, NS. 59. Bertha Jane Farquharson (22.Robert5, 6.Mary4, 3.Capt.3, 2.Charles2, 1.Charles1) b. Jul 28 1861, m. ___ 1879, James Mutch Clarke, b. ___ 1857, (son of John Clark and Matilda Mutch) d. ___ 1940, Note: Resided, Clarketown, PEI/ Edmonton, Alta. Bertha died ___ 1945, Edmonton, Alta., Note: Resided, Clarktown, PEI./Edmonton, Alta. i	J. Lester Clark b. ___ 1880, Occupation: Doctor, m. Annie Farrell. J. Lester died ___ 1946.
ii	Edith Clark b. ___ 1882, d. ___ 1900, Note: Unmarried. iii	Haldene Clark b. ___ 1883, d. ___ 1885.
iv	Harold Clarke b. ___ 1886, Clarktown, PEI., Occupation: Dentist, m. ___ 1918, Leonora Offergheit, b. Honolulu, Kingdom of Hawaii, Note: Resided, Lacombe, Alberta. Harold died ___ 1972, Note: Resided, Lacombe, Alberta. v	Lelia Clark b. ___ 1890, m. Scott Hamilton, Note: Resided, Edmonton, Alta. Lelia died +, Note: Resided, Edmonton, Alta. vi	Bertha Clark b. ___ 1891, m. Hudson Scott, Note: Resided, Edmonton, Alta. Bertha Note: Resided, Edmonton, Alta. vii	Hazel Clark b. ___ 1893, m. Thomas Walker. Hazel died ___ 1968.
viii	Wallace Clarke b. ___ 1894, m. Hugena Stairs, Note: Resided, Sedgewick, Alberta. Wallace died ___ 1970, Note: Resided, Sedgewick, Alberta. ix	Norma Clark b. ___ 1896, d. ___ 1896, Note: Stillborn, Twin. x	Edger Clark b. ___ 1896, d. ___ 1896, Note: Stillborn, Twin. xi	Heber Clark b. ___ 1899, d. ___ 1899. 60. Ida May Coffin Farquharson (22.Robert5, 6.Mary4, 3.Capt.3, 2.Charles2, 1.Charles1) b. Mar 15 1864, m. (1) Aug 23 1882, Isaac Murray Coffin, b. May 03 1854, (son of Kimble Coffin and Helen ELLEN M'Ewen) d. Oct 17 1882, Note: Resided, Morell, PEI., m. (2) Alfred Affleck, b. ___ 1867, d. ___ 1947, Note: Resided, Head of Hillsborough, PEI. Ida died ___ 1916, Note: Resided, Morell/Head of Hillsborough, PEI. i	Isaac Coffin d. 2 yrs. Old. ii	Amie F. Affleck b. ___ 1907, m. F. Gordon Hutcheson, b. ___ 1905, (son of G. F. Hutcheson and Ethel Coffin) d. ___ 1981, Note: Resided, Charlottetown, PEI. Amie died ___ 1971, Note: Resided, Charlottetown, PEI. 61. Alfred Percy Farquharson (22.Robert5, 6.Mary4, 3.Capt.3, 2.Charles2, 1.Charles1) b. Jun 23 1869, Mt. Stewart, PEI., Occupation: Farmer., m. Jan 12 1915, Rachel Lillian M'Kay, b. ___ 1889, d. ___ 1979. Alfred died ___ 1937, Interred: Charlottetown People's Cem., PEI. i	Robert Donald Farquharson b. ___ 1915, d. ___ 1983, Note: Unmarried. ii	John Ernest (Jack) Farquharson b. ___ 1917, m. Patricia Ann Kennedy. John died ___ 1968.
iii	Percy Douglas Farquharson b. ___ 1918, m. Margaret (Peggy) Milford, Note: Resided, Toronto, Ont. Percy died ___ 1984, Note: Resided, Toronto, Ont. iv	Ida Isabel Farquharson b. ___ 1920, m. Harold Everett (Hal) Brown, Occupation: Chiropractor., Note: Resided, California. Ida Note: Resided, California. v	William James Farquharson b. ___ 1922, m. Esther Wong, Note: Resided, California. William Note: Resided, California. vi	George Carruthers Farquharson b. ___ 1925, Occupation: Businessman., m. Jacqueline Mary Ames, Note: Resided, Peterborough, Ont. George Note: Resided, Peterborough, Ont. vii	Gordon MacKay Farquharson b. ___ 1927, Occupation: Lawyer, m. (1) June Vivian Malabar, b. ___ 1927, Note: Resided, Toronto, m. (2) Judy Bridges, Note: Resided, Toronto. Gordon Note: Resided, Toronto. 62. Edith Dorenda Farquharson (22.Robert5, 6.Mary4, 3.Capt.3, 2.Charles2, 1.Charles1) b. Apr 17 1871, m. Frank Clark Jardine, b. Apr 21 1867, d. Oct 01 1955, Interred: Charlottetown People's Cem., PEI., Note: Resided, Head of Hillsborough, PEI. Edith died Aug 28 1966, Interred: Charlottetown People's Cem., PEI., Note: Resided, Head of Hillsborough, PEI. i	Edgar Ernest Jardine b. Jul 18 1896, Occupation: Station Agent, m. Catherine Jean Arbing, b. Oct 28 1897, d. Mar 13 1981, Interred: Charlottetown People's Cem., PEI., Note: Resided, O'Leary/Charlottetown, PEI. Edgar died May 06 1995, Interred: Charlottetown People's Cem., PEI., Note: Resided, O'Leary/Charlottetown, PEI. ii	Reginald Jardine b. ___ 1897, Occupation: Soldier., d. ___ 1920, Note: Unmarried. iii	John Arthur Jardine b. ___ 1904, m. Evelyn Amanda Killam, Note: Resided, Halifax, NS. John Note: Resided, Halifax, NS. iv	Infant Daughter b. Mar 05 1909, d. Mar 05 1909, Interred: Charlottetown People's Cem., PEI. 63. Mary Leila Farquharson (22.Robert5, 6.Mary4, 3.Capt.3, 2.Charles2, 1.Charles1) b. Jan 27 1874, m. Artemas Jardine, d. ___ 1952, Note: Resided, Head of Hillsborough, PEI. Mary died ___ 1955, Note: Resided, Head of Hillsborough, PEI. i	Guy Clifford Jardine m. Gladys Towns. ii	Percy Clayton Jardine b. ___ 1896, m. Muriel Chadwick. Percy died ___ 1965.
iii	Caroline Margaret Jardine b. ___ 1898, m. Stanley Spargo Herring, Note: Resided, Burlington. Caroline died ___ 1985, Note: Resided, Burlington. 64. Margaret MAGGIE Elizabeth Farquharson (22.Robert5, 6.Mary4, 3.Capt.3, 2.Charles2, 1.Charles1) b. Jul 06 1875, m. John Stewart M'Eachern, b. ___ 1878, Occupation: Farmer, d. ___ 1952, Interred: Mt. Stewart Cemetery, PEI., Note: Resided, Mt. Stewart, PEI. Margaret died ___ 1947, Interred: Mt. Stewart Cemetery, PEI., Note: Resided, Mt. Stewart, PEI. i	Ernest Joseph M'Eachern b. ___ 1906, m. Annie O'Hanley, d. +, Note: Resided, Mt. Stewart, PEI. Ernest died ___ 1979, Note: Resided, Mt. Stewart, PEI. ii	Morley M'Eachern b. ___ 1908, m. (1) Leah Warren, m. (2) ___ 1978, Leah M'Kinley, b. ___ 1910, (daughter of Robert M'Kinley and Ella Howard). Morley died ___ 1979, Interred: Mt. Stewart Cemetery, PEI. iii	Robert Alexander M'Eachern b. Apr 17 1911, m. Elizabeth Maude M'Millan. Robert died Jun 23 1961, Interred: St. James Ch. Cem, West Covehead, PEI. iv	John Andrew M'Eachern b. ___ 1914, Occupation: Pilot in RCAF., d. Sep 11 1941, Interred: Lassiemouth, Scotland. v	Mary M'Eachern b. ___ 1915, Occupation: Scoolteacher, m. Kenneth Edward M'Callum. Mary Note: Resided, St. Peters, PEI. 65. Ernest William Farquharson (22.Robert5, 6.Mary4, 3.Capt.3, 2.Charles2, 1.Charles1) b. Mar 01 1880, Occupation: CNR Conductor, m. Frances Dorenda Pigott, b. ___ 1884, d. ___ 1966, Charlottetown, PEI., Note: Resided, Mt. Stewart, PEI. Ernest died ___ 1968, Note: Resided, Mt. Stewart, PEI. i	Gladys May Farquharson b. Oct 03 1908, Occupation: D. of Nat. Defense., d. Feb 22 1978, Interred: Charlottetown People's Cem., PEI., Note: Unm., Resided, Ottawa, Ont. ii	Mary Caroline Farquharson b. ___ 1909, Occupation: Civil Servant., m. George H. R. Mitchell, Occupation: Woolsworths Manager, Note: Resided, St. John's, Nfld. Mary died ___ 1955, Note: Resided, St. John's, Nfld. iii	Helen Bertha Farquharson b. ___ 1911, Occupation: School Teacher., m. Alexander W. Matheson, b. Jun 11 1903, Occupation: Judge., Note: Resided, Charlottetown, PEI. Helen Note: Resided, Charlottetown, PEI. iv	Robert Montague Farquharson b. ___ 1913, Occupation: Canada Packers worker, m. Clare M'Millan, Note: Resided, Charlottetown, PEI. Robert Note: Resided, Charlottetown, PEI. v	Arthur Ernest Farquharson b. ___ 1914, Occupation: Civil Servant., m. Marion Gay, Note: Resided, PEI. Arthur Note: Resided, PEI. vi	James Kenneth Farquharson b. ___ 1914, Occupation: Chemical Engineer, m. Lijntje (Jessie) Vos, Note: Resided, PEI. James Note: Resided, PEI. vii	William Byron Farquharson b. ___ 1917, Occupation: Pilot., m. Doris Eula Affleck, Note: Resided, Mississauga, Ont. William died ___ 1986, Note: Resided, Mississauga, Ont. viii	Lyle Glover Farquharson b. ___ 1918, Occupation: Social Worker, m. divorced, John William Brehaut, Note: Resided, Montague, PEI. Lyle Note: Resided, Montague, PEI. ix	Frances Claire Farquharson b. Dec 15 1921, Occupation: Civil Servant., m. divorced, Gordon Stedman, Note: Resided, Montreal, PQ. Frances died Dec 02 1992, Interred: Charlottetown People's Cem., PEI., Note: Resided, Montreal, PQ. 66. Albert HAVILAND Smallwood (24.William5, 7.James4, 3.Capt.3, 2.Charles2, 1.Charles1) b. ___ 1862, m. Mar 27 1883, in Clifton, Lot 48, PEI., Henrietta Sophia Mason, b. ___ 1860, (daughter of George Mason and Sophia Mutch) d. ___ 1888, Note: Resided, Glendive, Montana. Albert Note: Resided, Glendive, Montana. i	Warren Smallwood b. ___ 1884, Note: Died young, PEI. 67. Charles William Smallwood (25.David5, 7.James4, 3.Capt.3, 2.Charles2, 1.Charles1) b. Jan 23 1873, Greenspond, Nfld., Occupation: Lumber Surveyor, m. Dec 21 1900, in Gower St. United Ch., St. John's, Nfld., Mary Ellen (Minnie) Devanna, b. ___ 1880, d. Feb 16 ? ?00, Interred: Mount Pleasant Cem., St. John's, Nfld. Charles died Feb 29 1956, St. John's, Nfld., Interred: Mount Pleasant Cem., St. John's, Nfld. i	Joseph Roberts (Joey) Smallwood b. Dec 24 1900, Gambo, Nfld., Occupation: Politician/Premier NFLD., m. Clara Isobel Oates, b. Carbonear, Nfld. Joseph died Dec 17 1991, Roaches Line, Conception Bay, Nfld., Interred: Dec 21 1991, St. Johns, Nfld., Note: Resided, Conception Bay, Nfld. v	Sadie Smallwood Note: No Offspring. 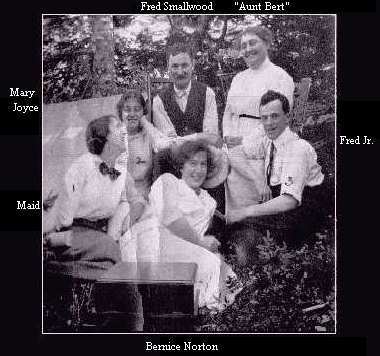 vi	Alice Smallwood m. Alfred Harris, Note: Resided, Newfoundland/Ontario. Alice Note: Resided, Newfoundland/Ontario. viii	Reginald Smallwood b. Feb 04 1916, St. Johns, Nfld., m. Aug 08 1938, Lillian Soper, b. Lady Cove, Random Isl., Nfld., Note: Resided, St. Johns, Nfld. Reginald Note: Resided, St. Johns, Nfld. xii	Maxine Smallwood b. Dec 24 1924. 68. Frederick (Fred) Smallwood (25.David5, 7.James4, 3.Capt.3, 2.Charles2, 1.Charles1) Occupation: Bootmaker, m. (1) Unknown, m. (2) Jan 10 1901, Roberta Henrietta Hyde, b. Sep 09 1868, Meadowbank, West River, PEI., (daughter of Samuel Hyde and Jane Matilda Mutch) d. ___ 1949, Interred: Charlottetown People's Cem., PEI., Note: Resided, St. Johns, Nfld. Frederick died ___ 1916, Note: Resided, St. Johns, Nfld. i	Walter R. Smallwood m. Mary Joyce. ii	Frederick W. Smallwood Jr. b. ___ 1892, m. Mabel Rowe, b. ___ 1894, d. Apr 04 1968. Frederick died Feb 19 1970. 69. Damaris Watts WATSIE M'Leod (26.James5, 8.Margaret4, 3.Capt.3, 2.Charles2, 1.Charles1) m. Samuel Hume. i	Hannah Zibiah SIBBIE Hume m. Frank Lowe. 70. Joseph Smallwood Brown (27.William5, 9.Catherine4, 3.Capt.3, 2.Charles2, 1.Charles1) b. ___ 1870, m. Alice MAUD Carr, b. ___ 1877, d. ___ 1972, Note: Resided, York, PEI. Joseph died Feb 24 1910, Note: Resided, York, PEI. i	Earl Carr Brown b. Oct 19 1898, Baptised: Jan 21 1910, d. Oct 1989.
ii	Horace Brown b. Jul 15 1900, Baptised: Oct 21 1910.
iii	Ruth Brown b. Jun 07 1910, Baptised: Jan 21 1910, m. Robert Constable, Note: Resided, Charlottetown, PEI. Ruth Note: Resided, Charlottetown, PEI. 71. Norman Campbell Brown (27.William5, 9.Catherine4, 3.Capt.3, 2.Charles2, 1.Charles1) b. ___ 1875, m. Lillian R. Quigley, b. ___ 1881, d. ___ 1959, Interred: St. James Ch. Cem, West Covehead, PEI., Note: Resided, Cove Head Road, PEI. Norman died ___ 1930, Interred: St. James Ch. Cem, West Covehead, PEI., Note: Resided, Cove Head Road, PEI. i	William Taft Brown b. Feb 18 1907, Baptised: Feb 14 1912.
ii	Marion J. Brown b. Jan 09 1907, m. Dec 14 1935, R. Warren Marshall, b. Aug 06 1903, (son of Louis Marshall and Katie Belle Carr) d. Oct 27 1988, Interred: St. James Ch. Cem, West Covehead, PEI. Marion died Mar 06 1990, Interred: St. James Ch. Cem, West Covehead, PEI. iii	Theodore Roosevelt Brown b. Aug 14 1909, Baptised: Feb 14 1912.
iv	Hammond Arthur Brown b. Sep 10 1910, Baptised: Feb 14 1912.
v	Robert Borden Brown b. Sep 09 1911, Baptised: Feb 14 1912, m. Sarah Neil. 72. Mary Ann Brown (27.William5, 9.Catherine4, 3.Capt.3, 2.Charles2, 1.Charles1) b. ___ 1879, m. William Carr, Note: Resided, PEI. Mary died ___ 1903, Note: Resided, PEI. i	Herbert Carr m. Annie. Herbert died +. ii	Jane Carr m. Frank M'Leod. Jane died +. 73. George H. Brown (27.William5, 9.Catherine4, 3.Capt.3, 2.Charles2, 1.Charles1) b. Jun 08 1884, m. Edwina Cloitier. George died Feb 27 1932.
i	Daisy M. Brown b. Sep 04 1915, m. Everett Ford, b. Jan 11 1903, d. Jul 21 1991, Interred: St. John's Ang. Cem., Milton, PEI., Note: Resided, Winsloe, PEI. Daisy Interred: North Milton Cem., N. Milton, PEI., Note: Resided, Winsloe, PEI. 74. Clara Brown (27.William5, 9.Catherine4, 3.Capt.3, 2.Charles2, 1.Charles1) b. ___ 1888, m. William White. i	Beatrice White b. ___ 1911, m. James Hebb, d. +, Note: Resided, Rockville, Md. Beatrice Note: Resided, Rockville, Md. ii	Clara White b. ___ 1917, m. Richard Stolz, Note: Resided, Tennafly, NJ. Clara Note: Resided, Tennafly, NJ. iii	William White b. ___ 1923.
iv	Jean White b. ___ 1929, m. Terrance Long. vi	James White b. ___ 1930, m. Elizabeth Ardeeser. 75. David Joseph Coffin (30.Mary5, 9.Catherine4, 3.Capt.3, 2.Charles2, 1.Charles1) b. CIR 1866, Fortune Bridge, PEI., Occupation: Farmer, m. in Boston, Suffolk, Mass., Ellen E. "Nellie" Aitken, b. Jul 10 1874, Fortune Bridge, PEI., d. Oct 1943, Fortune Bridge, PEI., Interred: Bay Fortune United Church Cem., PEI. David died CIR 1956, Interred: Bay Fortune United Church Cem., PEI. i	Ruth Marion Coffin b. Apr 22 1900, Fortune Bridge, PEI., m. (1) Unknown, m. (2) CIR 1928, John Horton. ii	Hazel Jane Coffin b. Feb 21 1902, Fortune Bridge, PEI., m. Edward C. Barrett. Hazel died Jan 27 1997, Charlottetown, PEI., Interred: People's Cem., Charlottetown, PEI. iii	Ruby Bell Coffin b. Nov 22 1907, m. Fred Barrett. Ruby died Fortune Bridge, PEI. iv	Cora Elizabeth Coffin b. Nov 04 1909, m. Floyd Archibald M'Kenzie, b. Jan 09 1907, Howe Point, PEI., Occupation: Fisherman, d. Dec 08 1979, Fortune Bridge, PEI., Interred: Bay Fortune United Church Cem., PEI. v	Lettie Agnes Coffin b. Mar 25 1912, Fortune Bridge, PEI., m. Nov 16 1932, Henry LEITH Townshend, b. Dec 10 1908, Rollo Bay West, PEI., d. Jun 21 1978, Souris River, PEI. vi	Jocelyn David Coffin b. Jan 13 1915, Fortune Bridge, PEI., m. (1) Edna Burke, b. ___ 1920, Fortune Bridge, PEI., m. (2) Apr 02 1943, Clara Vera Burke, b. Nov 10 1914, Bay Fortune, PEI. 76. Phebe Jane Coffin (30.Mary5, 9.Catherine4, 3.Capt.3, 2.Charles2, 1.Charles1) b. CIR 1868, Fortune Bridge, PEI., m. Mr. Woolridge. 77. John Haviland Coffin (30.Mary5, 9.Catherine4, 3.Capt.3, 2.Charles2, 1.Charles1) b. ___ 1870, Bay Fortune, PEI., m. Nellie Leggett. i	Marina RENA Coffin m. (1) Nov 22 1926, John Pippy, Occupation: Buttermaker, m. (2) Eldon Bernard. ii	Clara Coffin Occupation: Housekeeper., d. USA. 78. Mary Malinda Coffin (30.Mary5, 9.Catherine4, 3.Capt.3, 2.Charles2, 1.Charles1) b. Jun 06 1875, Fortune Bridge, PEI., m. Mr. White. Dave Hunter and The Island Register: HTML and Graphics© 1998, 1999, 2000.